Howitt, Samuel (1756 – Somers Town 1822). 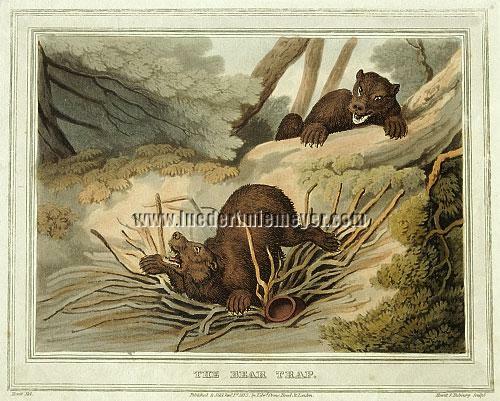 The Bear Trap. The bear in the pit. A second one just climbing over a trunk. Aquatint together with Matthew Dubourg (fl. London 1808-38) in the original coloring. Inscribed: Howitt Del. / Published & Sold Jany. 1st. 1813, by Edwd. Orme Bond St. London. / Howitt & Dubourg Sculpt., otherwise as above. 7 × 8⅝ in (17.8 × 21.8 cm). Tooley 225, 21. – From the 1819 2nd edition of FOREIGN FIELD SPORTS , Schwerdt I (1928), 177 ff. : “The coloured plates … especially those drawn by Howitt, are fine, both as regards draughtsmanship and colouring … (The book) is sure to increase in value … ”. – Two sides of the wide white margin somewhat foxed. One spot also in the clean top margin.